When the issue first started I promptly called Jennifer in the service department of Anderson Nissan in Asheville, NC where I regularly have my car serviced, to get the issue investigated…unfortunately, she informed me that the service department was closed for a day or so while they were having their floors resurfaced so my only option was to take the Leaf to the Hunter Nissan service department in nearby Hendersonville, NC for the check up. Upon arrival at Hunter I dropped my Leaf off in the service department and browsed the lot while I waited for a report. Soon, I found myself checking out the details of an NV200 small cargo van and shortly thereafter a wonderful sales associate ( I wish I could remember his name) introduced himself and we were off taking a test drive in the NV200. The test drive and conversation with the salesman was wonderful but obviously I had no intention on buying an NV200 because it is powered by the wrong fuel for my needs…gasoline. The reason I test drove it was to try to get an idea what the electric version of this small van might be like to drive. Th electric version is the eNV200 and it is powered by the very same battery-electric drive-train found in the Leaf. My test drive was wonderful, with the NV200 driving surprisingly well for a small van…it really felt like I was driving a car. However, I do not believe it is a good comparison with the eNV200 because truthfully, from my point of view as an EV owner – it was noisy, vibrated, and smelled a bit odd. Please don’t get me wrong, I’m not talking down the NV200 at all, it is a very capable vehicle and all those things I mentioned are status quo for gas powered vehicles. In my defense I suppose I am a bit more sensitive to these things because I have been driving electric almost every day now for 2.5 years so I guess you could say I’m a bit biased since my conversion to the wonderful all electric Nissan Leaf. In fact, thanks to Nissan who is leading the way in the world of electric vehicles, I’m a total convert to driving electric. So much so in fact that I will eventually divest from gasoline totally and the path to make that happen for me is the eNV200. If Nissan ever decides to bring it to the USA I will be the first to own one and will use it as the company vehicle in my nonprofit wildlife rehabilitation and conservation and renewable energy education organization Earthshine Nature Programs. I’m sure the eNV200 is an even capable vehicle than the NV200 due to its lower center of gravity, higher low end torque, virtually silent drive-train, and much lower operating costs. Sadly however, the game changing all electric version of this wonderful small van is currently only available in Europe and Japan and there is no word from Nissan when or if they have plans to bring it to the USA. I feel so passionate about this vehicle becoming a reality in the USA that I recently authored a blog post on this amazing van and how I believe Nissan should get to work on bringing it to the USA as soon as possible. In my opinion, if they do not, they are missing out on a really great opportunity found in the thousands of large and small business owners, Uber, Lyft and taxi drivers that would jump at the chance to lower their overhead, make a difference, and drive clean, green, EV vans on their daily routes in cities, towns, and in the countryside of the USA. the 100% electric, zero emission Nissan Leaf. Until that time I will continue to drive my Leaf and love every gas free mile. 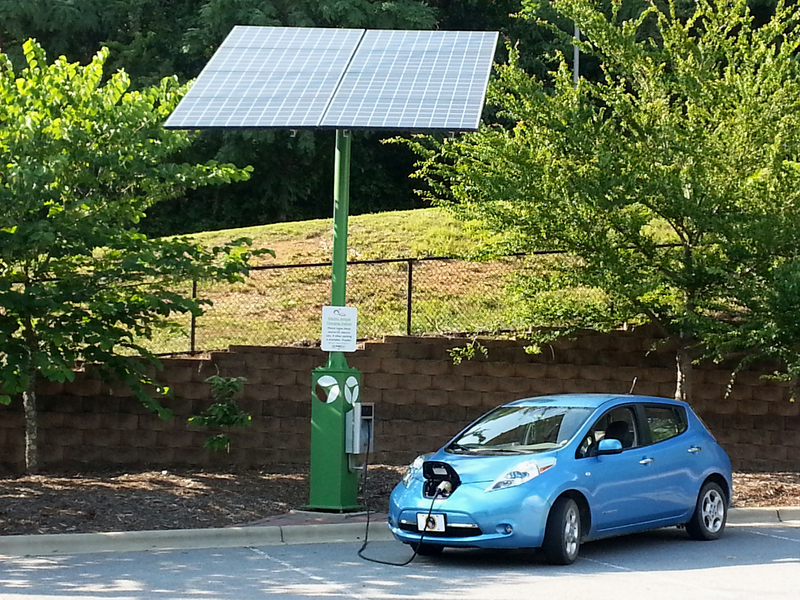 Charging up at a BrightfieldTS solar charging station in Asheville, NC. After the test drive I had a nice chat with some of the Nissan employees about the eNV200, Leaf, IDS concept and the future of EV’s in general. Then I received the message that my car was ready and I was told that they could not duplicate the problem…interesting? I knew the problem was there because I had experienced it but Nissan’s own service technicians could not find any issues…and apparently their diagnostics did not reveal any issues either…reminds me of when you finally get in to see the doctor…and the symptoms are gone. Murphy’s law. I drove off the lot a bit frustrated with the situation but since there was nothing I could do about it I went on with my day. 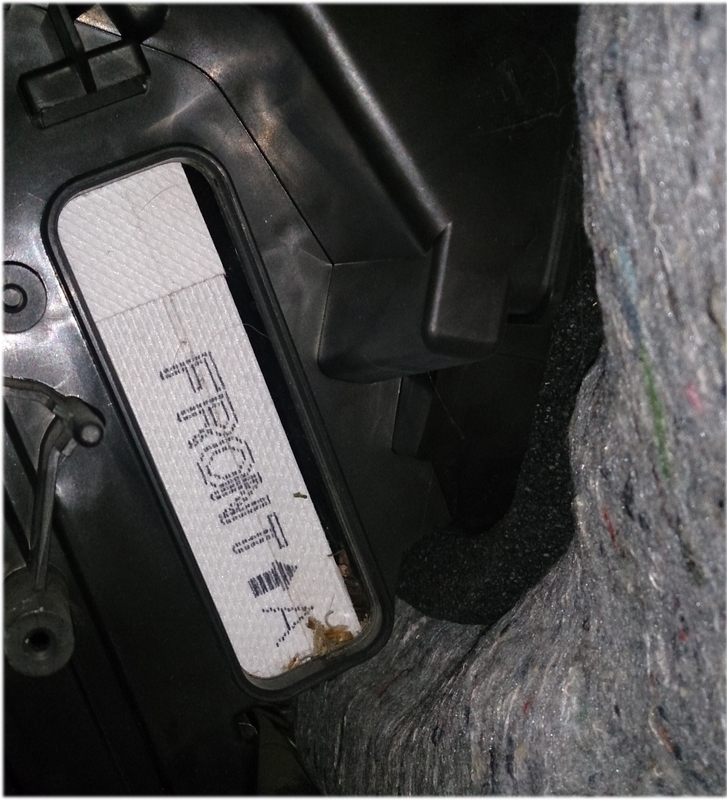 As soon as the Leaf’s brakes started acting up I rolled to a stop and hit the Leaf Spy only to discover all systems were green and operating perfectly – save for the BCM that was throwing out an error code. I promptly called Anderson Nissan and informed Jennifer of the issue. She said that I should get the Leaf to her ASAP. I agreed with her because as I see it – if there is a both a physically detectable and technologically documented problem in the braking system of you car, putting things off is never a safe option. I was only about 5 miles from Anderson Nissan so off I went and soon I was rolling through the big bay doors and onto the beautiful, newly finished service room floor. Jennifer was there to greet me and after she gathered the required information she informed me that the 3 year/36k mile basic warranty on the car had expired within the last few days and that the braking system was no longer covered by the warranty…bummer. She said however that since I had documented the problem almost two months before and had been a loyal customer of the Anderson Nissan Service Department since I had purchased the Leaf, that she would contact corporate and see about getting the part covered in “good faith” but the only catch was that it may take several days to get an answer from Nissan HQ. I had no issues with waiting because Jennifer and team quickly had me a loaner car – the pretty, new Nissan Altima in the photo below. I drove off leaving the Leaf behind thinking I would see it again in a few days…but that was not the case because Mr. Murphy is always ready and waiting to pull out his law and make life a bit more complicated for us all. 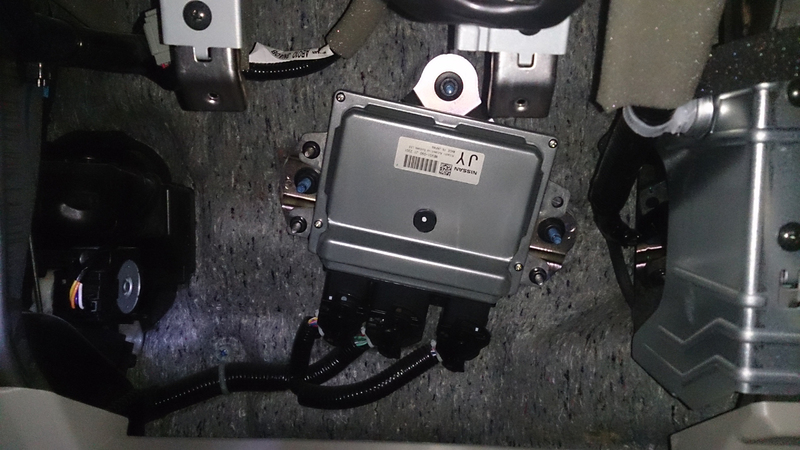 A few days later I spoke with Jennifer and learned that Nissan had agreed to cover the cost of the brake master cylinder and booster assembly as well as the Intelligent Brake Control Module (IBCM) under a good faith agreement. The only cost to me was going to be for the use of the loaner car that had now become a rental. This was great news to me especially when I found out the cost of the OEM components would have been $2000!! Ouch!! THANK YOU NISSAN and THANK YOU JENNIFER!! Later, I did some quick research online and found a used OEM unit for $265 which I would have opted for had Nissan not been able to cover the parts under warranty. I’m a teacher and do it yourself mechanic and would find covering a $2000 repair bill out of the question unless there was absolutely no other way. Luckily, that was not needed as Nissan agreed to cover the parts…whew! I am very glad I did not need to install used parts in my Leaf just yet because the car is still covered under its 5yr/60k mile power-train and 96 month/100k mile drive battery warranty so during that time I do not want to use anything but new OEM parts if possible for fear of voiding any part of the warranty. I may be overly cautious with this but I feel it is better to err on the side of caution in these matters. Jennifer then said that the parts needed to fix Elektra were not going to be in for several more days. I was fine with this as I had the now rental car but the issue was that I needed to go out of town on important family business and had no other option but drive the Altima. She said I could take the rental car out of town so on the road I went…WOW! Nissan and Jennifer are even more AWESOME!! A week later I returned from my out of town trip, borrowed a car and, and returned the Altima – which by the way gets amazing fuel economy – it averaged around 40 mpg for the entire time I had it! When I dropped off the Altima I learned from Jennifer that the parts were in transit and should be installed by the end of the week. At the same time I snapped this pic of Elektra looking lonely in a parking lot full of gas powered cars. A few days later I spoke with Jennifer again and she said the parts were going to be installed on Saturday! Woo Hoo!! Below is a pictorial timeline of the removal of Elektra’s faulty braking system components and the installation of the new parts. The defective parts removed. Note the hole in the top center looking into the cabin of the car. This is where the brake master cylinder/booster assembly bolts to the bulkhead. Awesome, friendly, service from Jennifer, Marlon and crew! Blue water leaf is not affiliated or responsible for any ads that may appear below this line. The author’s 2012 Nissan Leaf EV “plugged in” at a local solar farm. I offer just the facts on EV’s from the point of view of an EV owner of 2.5 years. FACT: In 2013 I purchased a one year old 2012 Nissan Leaf (100% electric car) with 1,200 miles on the odometer. I have now driven the Leaf over 33,000 gas free miles. UPDATE as of 6/21/17: I have now driven the Leaf over 50,000 miles. FACT: I drive it daily to work and back in all weather, on paved and gravel roads, and up and down the mountains we call home. I drive it an average of 40-45 miles/day and more on weekends. 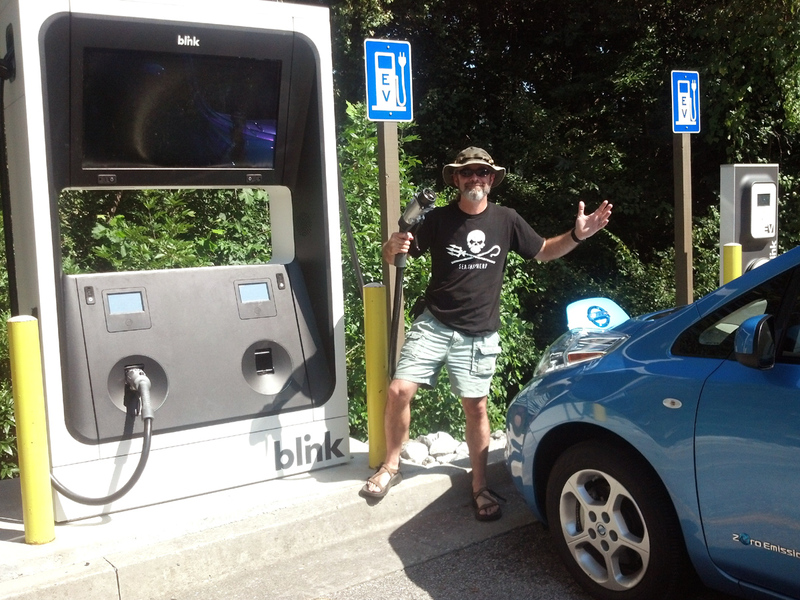 Due to the wonderful and growing EV charging network that continues to expand and open the roads to EV drivers – I can go almost anywhere in the WNC/Upstate SC/East Tennessee areas with no problems. A GE charging station in Black Mountain, NC. MYTH: It is very expensive to charge an EV. FACT: Even when I account for the cost of electricity over the last 2.5 years – I have still saved close to $3000 that I would have spent on gas and oil had we continued to drive two gas powered cars. 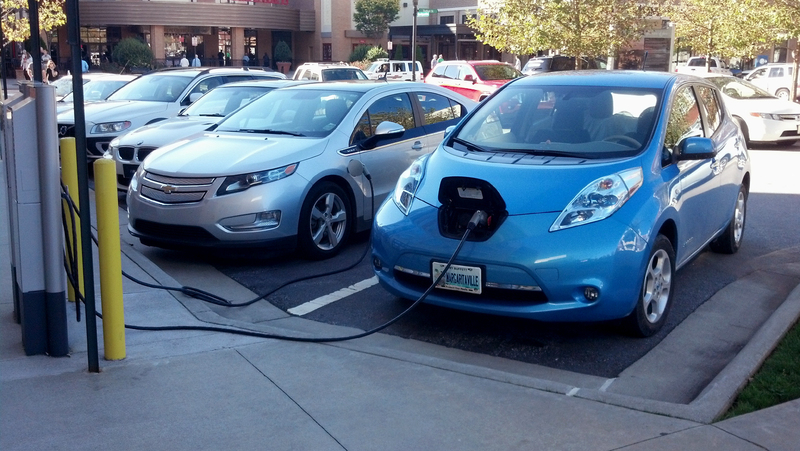 Charging the Leaf in downtown Salisbury, NC on a recent road trip. MYTH: EV’s have very short range, will run out of “juice” and leave you stranded. FACT: While the currently available EV’s do have limited ranges varying from around 70 to 300 miles on one charge – like most newer Internal Combustion Engine (ICE) powered vehicles they have alert systems to let you know when your fuel level is getting low. They also have sophisticated GPS connected navigation systems that allow you to plan your trip ahead of time taking into account stops at charging stations along the way. While it is understandable that this lifestyle is not for everyone, advances are being made daily in the EV, battery, and charging infrastructure that, within a few years time, will put 200 to 300+ mile range capable EV’s on the roads from start-ups to most of the world’s major auto makers that are now revealing some incredible new transportation technologies to the world such as the Nissan IDS concept, Tesla Model X, Model 3, Model Y, Tesla Pickup and Semi, Chevrolet Bolt, Workhorse pickup, Via motors, and the incredible and out of this world Faraday Future and many others that will hopefully lead to who knows what kind of amazing EV’s, and maybe one day an Apple EV and even an Electric-Corvette! No matter if you run out of a charge or if you run out of gas – it is your fault for not planning ahead as I found out recently in the blog post just before this one. A Tesla Model S charging. Let’s break it down…get ready because this is detailed. FACT: Battery Electric Vehicles BEV’s (the focus of this report) do not run on anything but electricity and are themselves – zero emission. That being said, depending on how that electricity is generated– the place it gets its electricity–could be “dirty” (coal) or “clean” (renewable energy) but in most places it is a combination of both so let’s dig deeper. FACT: A small ICE car emits ~390 grams of Carbon Dioxide CO2/mile. FACT: The average power consumed by a small EV is ~.25 KWh/mile. FACT: ~907 grams of CO2/KWh is emitted from coal fired power plants in the dirtiest 100% coal-based electricity generation areas. FACT: 907 (g) x .25 (KWh) = 226 grams/mile in dirtiest 100% coal-based electricity generation areas, which remains lower than the 390 grams from the small ICE car so in reality, even if your EV is charged in an area that gets all of its electricity from coal, EV’s are still cleaner than a comparable ICE powered vehicle. MYTH: Building more EV’s will require us to build many more power plants to provide all the electricity to operate all of them. FACT: EV’s are charged from the same utility grid that your mobile devices use. Like your devices, EV’s come with their own charging cable that plugs into a standard electrical outlet found on the outside of your house. Like most of your mobile electronic devices they are usually charged at night, while you are sleeping, and when electricity generated from emissions free wind and hydro power is in low demand, lower in cost, and goes mostly unused – so there is ample supply to power your EV. For those opposed to plugging in (or the busy, lazy and/or forgetful types) now in development are inductive charging highway lanes that, when you need a charge, you will just simply drive in the lane and your car will charge while moving at speed! There are also currently available inductive charging pads (just like you can buy for mobile devices) but made for select EV’s. This will eliminate the need to plug in your EV at home and possibly one day you will even be able to just park in an EV charging parking space and your car will automatically start charging as you walk away. FACT: The US power grid is getting cleaner every day as more fossil fuel fired power plants are retired and more renewable energy power systems go online – so in these areas especially, EV’s are much cleaner. FACT: Due to the fuel mix of the grid getting cleaner, EV’s get cleaner as they age. This is never a fact with ICE cars that constantly loose efficiency as they age due to wear and tear. Three Nissan Leafs, A Chevy Volt, and a Tesla Model S charging at the BrightfieldTS solar canopy charger in downtown Asheville, NC. FACT: One parking space covered with a canopy of photovoltaic solar panels (2.5KW) in the southeast would produce around 3,292 KWh/year. This will operate an EV for around 13-16K miles of 100% emissions free driving on clean, sunshine generated electricity! 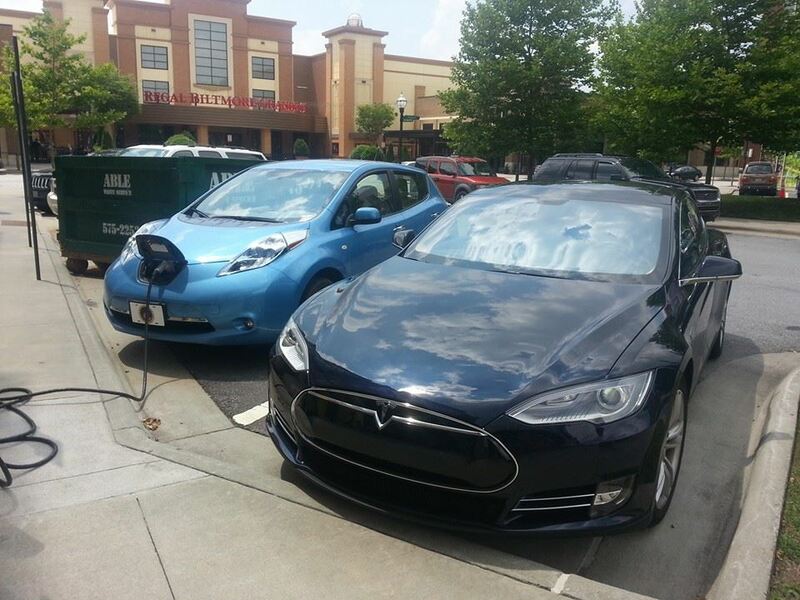 The owner’s Leaf on the right and another local Leaf charging at the Sierra Nevada Brewing Company’s solar powered EV charging station in Mills River, NC. FACT: EV’s produce a portion of their own fuel via the process known as regenerative breaking – try to find an ICE powered vehicle that does that! 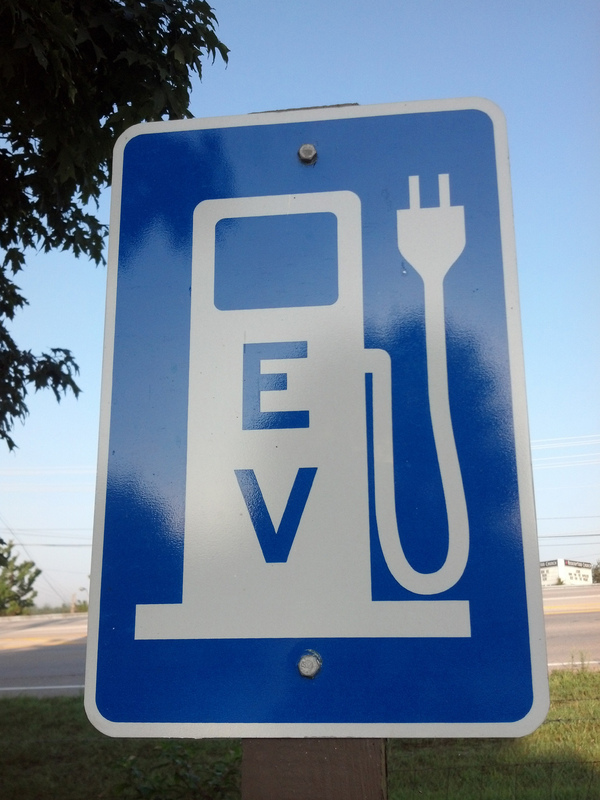 FACT: The average EV travels an average of 4 miles/Kilowatt hour (KWh) of electricity. FACT: It takes 6 KWh of electricity to refine one gallon of gasoline (source US DOE). FACT: The average EV can travel 24 miles on the power that it takes to refine just one gallon of gasoline! FACT: It takes ~9 KWh of energy to extract and transport the crude oil that will be refined into that gasoline. FACT: An EV could travel an additional 36 miles on this energy. Save the 44 gallons of water that it takes to refine that one gallon of gasoline! It is a no-brainer. While anyone with a purely electric vehicle will tell you that good trip planning is essential for anyone owning a fully electric vehicle, you just never know what may happen out there on the road. Back in the days before electric vehicles I would always carry a small plastic “jerrycan” just in case I ran out of gas. 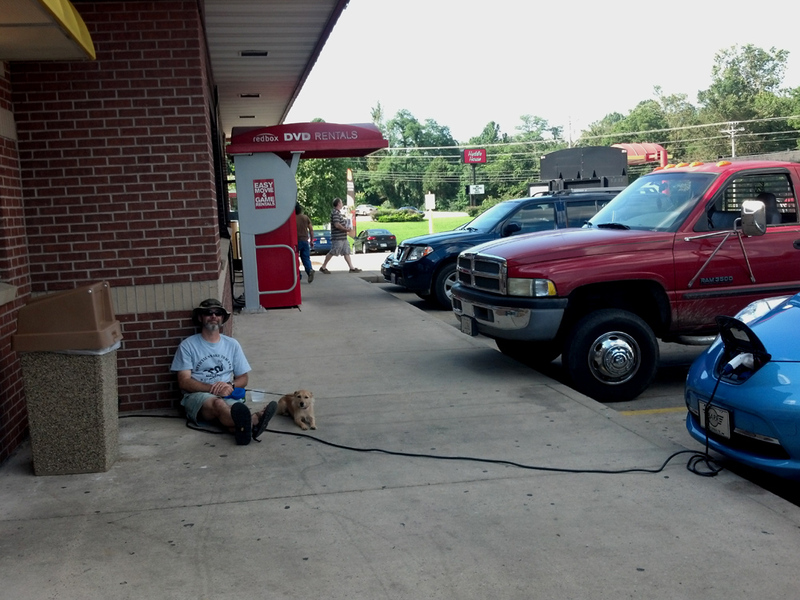 Today, I always carry a 100′ heavy duty extention cord in my EV for the very same purpose. Good thing for those of us that drive 100% electric vehicles, there are thousands of dedicated charging stations in most cities across the USA and the world however, in between those EV chargers there are also millions of standard 110v electric outlets everywhere you will find people and their buildings. These outlets and their electricity can be accessed in emergencies…with permission of course. 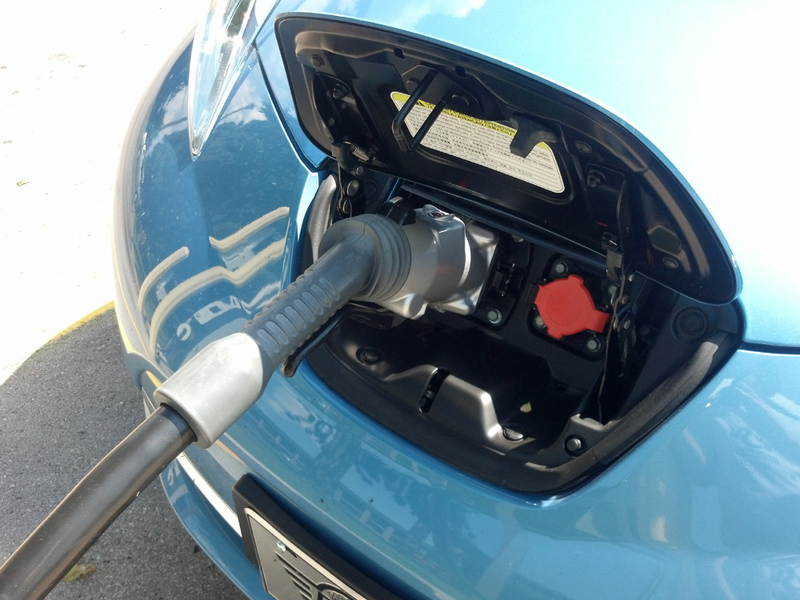 That said, I have only had to plug into a handfull of outlets due to a low battery charge since owning the Leaf–one of the first being on day one of Leaf ownership…I was such a greenhorn :-)…and most recently on a road trip I covered in this blog posting. Trickle charging at the SmokyQ BBQ in Marion, NC. When I have had to do so, most of the people that have granted me access to their outlets have been very friendly, very interested in EV technology, and have freely offered some of their electricity. In return I have always left them a generous tip for the use of their electricity and their time. In almost every instance the most valuable thing I have driven away with is not the electricity, but the friendly conversation with an individual I would have never met if not for my EV. I offer the below recent video as an example. In fact, many EV owners including myself, list their homes and businesses on Plugshare.com as residential EV charging locations. They do this in support of other EV drivers that may be close to the end of their vehicle’s range and need a charge to get to the next high power charging station and they do this to be part of the rapidly growing community of like-minded, forward thinking EV owners who see a brighter, cleaner, fossil fuel free future on the horizon for us all. MYTH: It is very expensive to power an EV. FACT: The average cost of electricity in the US is 12 cents/kWh. Therefore the average person driving an average EV 15,000 miles per year will pay about $540.00 per year to charge it. Personally I spend less than $300/year on electricity to fuel my Leaf…how much did you pay for gasoline/diesel last year? I bet it was much more than that. Think about what could you have done with all that extra money you spent on gas and oil? Just think about it…or remain in denial of the facts. It is your choice. 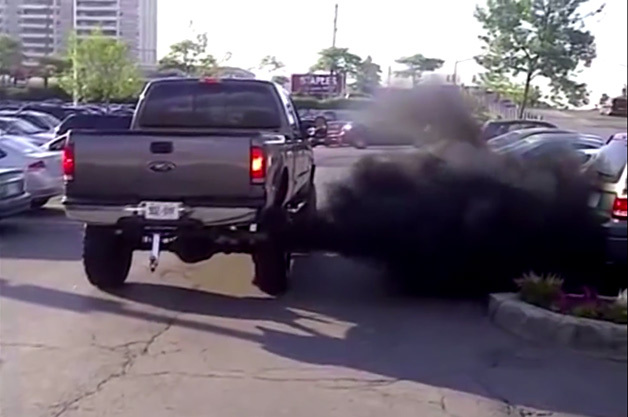 FACT: One piece of gas burning lawn equipment emits more hydrocarbon pollution into our shared atmosphere than a gasoline-guzzling crew-cab pickup truck! You would have to drive a 6.2L V8 truck almost 4000 miles to equal the emissions produced in 30 minuets of use by a gas powered 2-cycle engine such as a string trimmer (weed-eater). Why not use an all electric string trimmer or lawn mower—there are many available now and they all can even be fueled with renewable energy you can generate at home! UPDATE 6/21/17: Since I wrote this article many companies have introduced all electric lawn equipment such as the Ego backpack leaf blower and the Husqvarna Auto Mower and many others. 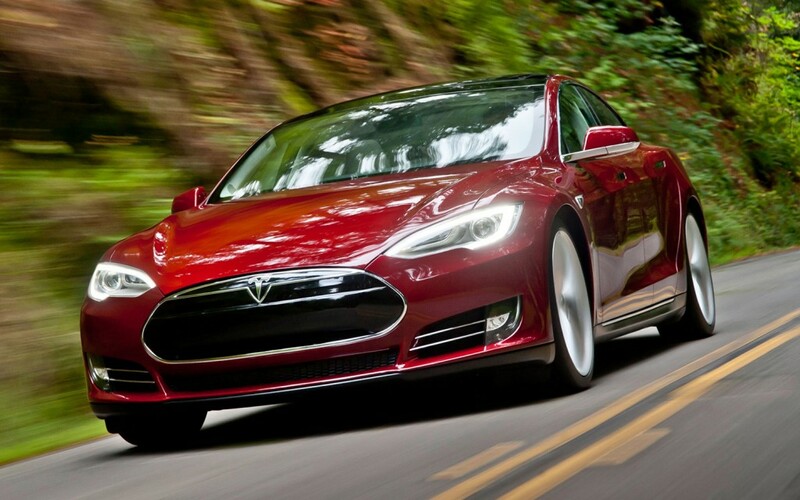 Electric vehicles are quickly and quietly taking over the world and that is a very good thing! MYTH: EV’s, solar, wind, and other renewable power sources are not American because they do not create jobs or use the oil/gas that we fight deadly wars to acquire. FACT: The Nissan Leaf EV is made in Smyrna Tennessee and provides over 300 American workers with excellent jobs. Tesla provides around 6000 Americans jobs now and will employ 12,000 after the Gigafactory goes online. The number of employees working in the solar industry has more than doubled in five years and today there are now over 200,000 Americans working in solar. Believe it or not, there are now more people working in solar than in gas and oil fields and that’s almost three times the size of the entire coal mining industry…the carbon bubble is bursting. The wind energy industry provides great jobs to over 70,000 Americans and clean power to over 18 million homes. And that’s just for starters…companies like Solar City and Arcadia Power are changing the way we acquire our energy at home from renewable energy providers. FACT: Sourcing our energy domestically (be it solar, wind, hydro, coal—whatever the source) provides many good jobs to Americans and is much more efficient and much safer than traveling thousands of miles, dealing with foreign governments that are often hostile and feed terrorism groups, extracting the crude oil, then finally bringing it back home to be refined and used…often at great cost and loss of life due to the wars that often must be fought to keep it flowing. FACT: It is more American to be self sufficient and produce your own energy at home, than it is to rely an outside source to provide you with that energy. FACT: You can power your home and your EV with off-the-shelf renewable energy (solar, wind, hydro, etc ) that you produce at home…and even make a profit from the excess! 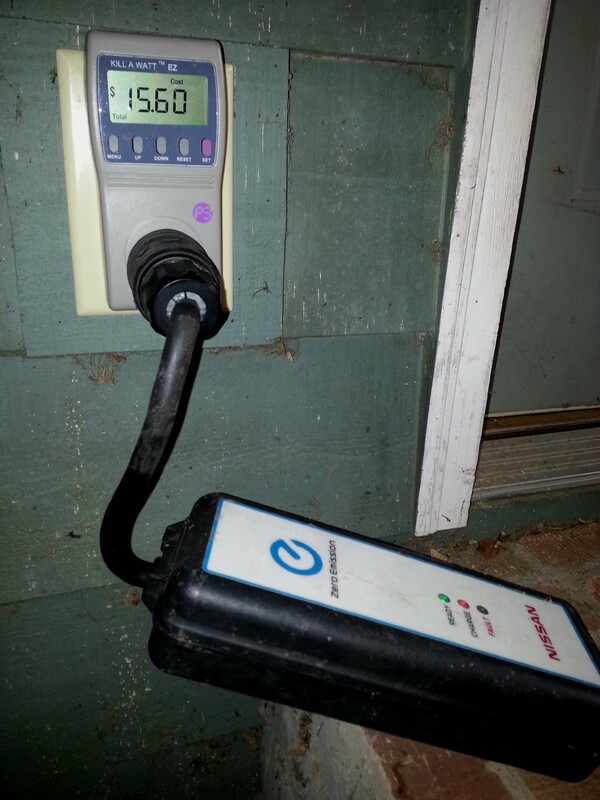 A solar powered home in Asheville with a monthly power bill of less than $20! MYTH: EV’s are expensive to work on. FACT: While it is no secret that EV’s have many similar systems as ICE powered vehicles such as braking, steering, suspention, heating etc. However, EV’s rarely need major servicing on their drive systems due to the simple fact that they have far fewer moving parts in their power plant whereas the average ICE engine has thousands! Therefore, EV’s require far less maintenance to keep them “healthy” and are therefore much more economical to drive. I have been driving my Leaf now for over 33k miles and the little EV has required no specialized routine maintenance by me other than the occasional washing and vacuuming, a set of new windshield wiper blades, adding a little air to the tires, and the occasional topping off of the washer fluid – you know, the things you would need to do to any type of vehicular construct no matter its fuel source. Recently, I had to replace the cabin air filter. By replacing the filter myself I saved around $50 labor cost (as quoted by my local Nissan dealership)! Costs: $35 for the filter and about an hour of my time. This is not that bad considering this is the first in-depth preventative maintenance (that was not covered in the warranty*) that I have completed on the car…in 33k miles! Had this been a gasoline/diesel powered vehicle I would have had to spend far more time and money over the same 30K mile time-frame. For example, to keep my 1999 Toyota 4Runner “Godzilla”, my only remaining ICE vehicle that I keep only for long range trips and hauling large loads, running in an efficient as possible manner (for a machine with so many miles – 200+k – and so many moving parts that can and will wear out due to constant use thereby lowering the fuel economy of the vehicle and lowering the amount of money in my bank account) I use G-Oil, a bio-based fully synthetic American made motor oil, and I change the oil filter when I change the oil. Just the oil/filter changes for my 1999 Toyota 4Runner have cost me $230** over the last 30k miles! 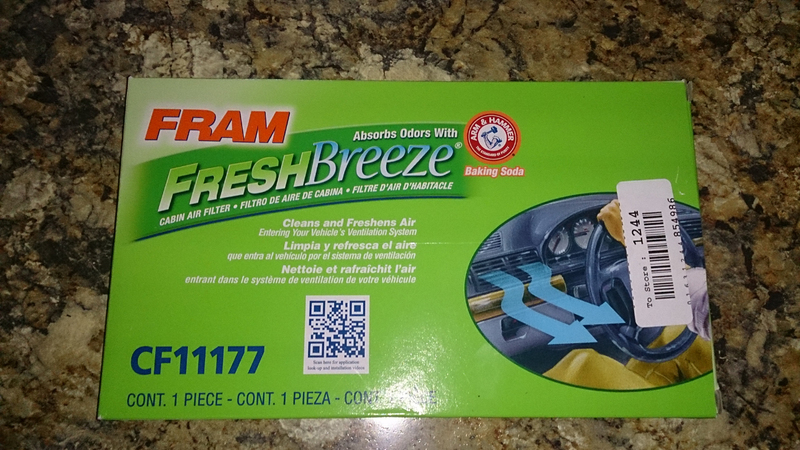 Operational costs for user replaceable parts and non warranty covered parts for the Leaf during this same period of time = $55 (wiper blades and cabin air filter)! FACT: The simple fact that EV’s do not have as many moving parts as petroleum powered vehicles makes them much more reliable and cost effective to operate than their fossil fuel powered counterparts. The do not have or need any of the parts that commonly wear out in gas/diesel vehicles such as: belts, chains, hoses, air/fuel filters, water pump, spark plugs, glow plugs, oil, filter, clutch, transmission, muffler, catalytic converter, exhaust pipe…they do not even have an engine. 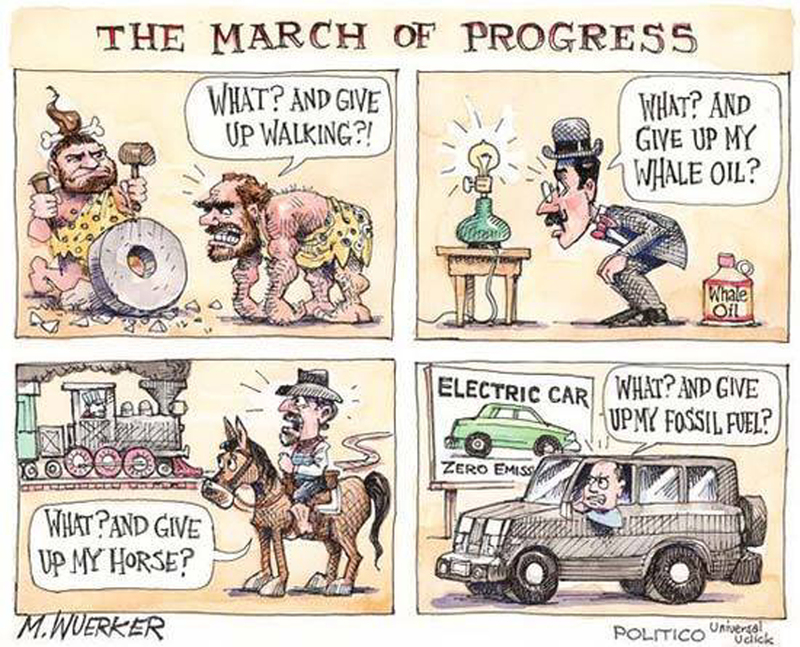 MYTH: EV’s are new…scary…future technology and cannot be trusted. FACT: Electric vehicles are anything but scary and nothing new. The electric motor that moves them has only a few long lived moving parts and is a proven technology that has been used to make our lives easier since the mid-late 19 century. FACT: New technologies often have bugs that need to be worked out and then an adoption period before becoming mainstream. Examples: the light bulb, the toilet, the automobile, the air plane, the microwave, the personal computer, the cellular phone, the rocket ship…the electric car is no different and will see some setbacks but it is here to stay. FACT: If your house or business is connected to the grid, and you or your company pays a power bill, then your, and most everyone’s houses/businesses are electric. Washer, dryer, refrigerator, freezer, stove and range, heating and cooling, lighting, entertainment systems, kitchen and many bathroom appliances, computers, mobile devices…electric…with many of these systems relying on electric motors and systems that quietly work in the background keeping our lives and the lives of our devices comfortable and functional. Why is it then that we continue to use outdated, noisy, toxic, leaky, high maintenance, complicated, petroleum powered transportation systems to get around on earth, in the water, and in the sky? Part of the answer to the above question may be fear of change driven by a inate and often handed down complacency that many feel when they get set in their ways and comfortably used to any form of technology they have grown up with. To some, anything new, especially if it upsets the comfortable status quo, is seen as an invader that must be ignored and even stopped at all costs. I suppose not everyone can be an early adopter and game changer like Elon Musk. The final parts to the answer are the simply complicated politics and lots and lots of dirty money. In this recent article by Blue Ridge Electric Vehicle Club president Rudy Beharrysingh he states: The political implications of oil and gas are huge. Currently, the U.S. imports about 9.5 million barrels per day of oil. About 30 percent of this is from OPEC, with half of this from the Persian Gulf. 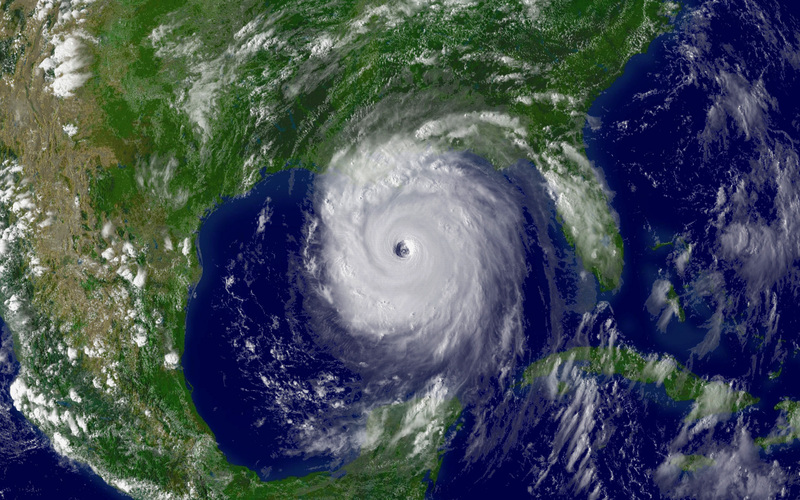 That’s about 1.4 million barrels per day coming from the Persian Gulf. At a cost of $35 per barrel that is $50 million per day that we (consumers) send to the Middle East (on the order of $20 billion per year). And, that’s low compared to what it used to be. Need I say more…? Fires. According to the NFPA, cars catch fire on American highways once every two minutes. There were an average of 184,333 vehicle fires per year from 2008 to 2013. (I went back only to 2008 since it was the first year a highway-capable all-electric vehicle in serial production was available in the United States. That vehicle was the Tesla Roadster). Out of those 184,333 fires, less than a dozen of involved electric vehicles…ALL of the others were liquid fuel powered vehicles. There were an average of 1651 car fire injury and death victims every year from 2008-2013. In fact, due to fires involving liquid fueled vehicles 1765 people lost their lives during that timeframe. “The risk of a car or vehicle fire is even greater than the risk of an apartment fire. More people die in vehicle fires than in apartment fires each year in the United States,” said AAA President Robert Darblenet. More info on fires related to electric powered vehicles and other devices and systems can be found in this article and in this Wikipedia article. Fact: electric vehicles present far less of a fire hazard than ICE powered vehicles. Think of it like this: if everyone had been driving clean, fast, safe, low maintenance electric vehicles for the last century, and someone tried to get you to drive or even ride in a vehicle powered by an incredibly toxic, flammable, explosive, liquid fuel—what would you do? Personally, I would R.U.N.N.O.F.T! Situation #1. Year 1986. 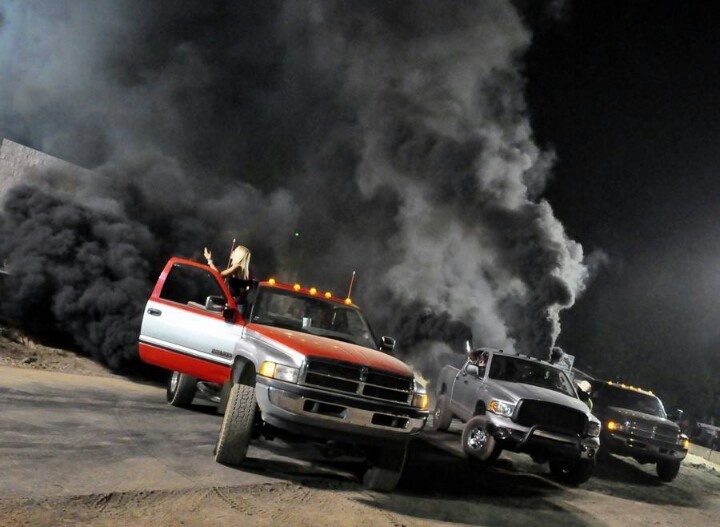 My old Chevy truck would not start so I continued to give the engine more gas, the engine flooded, fuel leaked out of carbureator, a spark from a cracked spark plug wire ignited the fuel leak sending flames up and out of the engine bay melting all the rubber and plastic items under the hood. I put out the fire with a small fire extinguisher I kept under the seat and when it ran out I had to toss a jacket on the fire to finally put it out. If not for my fast thinking the vehicle would have burned to the ground and this would have caused me great peril. Situation #2. Year 1991. Although not a road vehicle incident, I believe under the circumstances it still applies. My old lawn tractor was running rough. I took off the air filter housing and adjusted the carbureator to richen the mixture and it started running better. I then failed to replace air filter assembly. A few moments later the engine backfired through the carbuerator sending a saber of flame straight up and into the old plastic fuel tank (that was soaked with fuel residue) which subsequently ignited into a ball of flame. This melted the fuel tank causing raw gasoline to cascade down onto engine and tractor like a flaming waterfall of peril. The tractor quickly began to burn to the ground. A passing off duty firetruck stopped to extinguish the tractor as it sat burning in middle of a field. Situation #3. Year 2000. While my driving 1966 Land Rover up a steep highway grade, the vehicle’s cab suddenly filled with thick, acrid, white smoke and at the same time I smelled an intense gasoline smell!! I quickly pulled the vehicle off the road and bailed out running about 100 feet away leaving the engine running and door open for fear of meeting my ultimate demise! I watched from a distance as the smokle cleared from the cab of the still running vehicle and then a few seconds later the vehicle shut itself off as the fuel in the carbuerator ran out. I did not want to get near it for fear of whatever caused the issue possibly igniting a gas vapor explosion, fuel fire, and loads of deadly peril. After about 20 minutes of watching I decided that it was safe and carefully approached the vehicle. I soon discovered that the issue had been caused by faulty wiring. A wire had been routed around the fuel line and normal vehicle vibrations had caused the wire to abrade against the metal frame of vehicle creating an electrical short which burned all the insulation off of the wire causing the acrid smoke. The exposed red hot wire then melted through the plastic fuel line cutting it totally in half. Gasoline then poured out of the fuel line and all over the top of the fuel tank – yet somehow, no ignition had occured. Talk about the luck of the Irish–it was with me that day. I would not be writing this if the gas fumes had ignited. If that had happened, the cab would have become an instant inferno, and both fuel tanks, that were 1/2 full or less and located under the driver and passenger seats, would have possibly ignited killing me in a flaming fuel fire worthy of dramatic news worthy sensationalism. So you might say I am somewhat qualified, or at least have some life experience in the area of what can happen when gasoline and an ignition source are brought together. You could also say that I have the obligation to inform people of the error of their ways when I see them ignoring common sense and the warning labels posted all over the gasoline and diesel fueling station’s liquid fuel pumping machines. However, I also know from past experience that when I try to help others by offering friendly advice on the subject, I have always been met by rude comments like “mind your own business”, “it’s a free country” or “#!@! off! !”…so, since these people apparently either are; totally ignorant and/or do not understand the science behind the reality of the situation, have a death wish, or just do not care at all about their own safety or the safety of the other human beings that may be nearby. So, now whenever I encounter these situations I always report these individuals to the fueling station attendants and then I get away from the area as fast as possible because highly flammable liquid fuels + the increased potential for static/spark/flame induced fuel vapor ignition + careless, know-it-all or ignorant humans = loads of peril and Darwin awards just waiting to happen. MYTH: Electric vehicles are expensive. FACT: While it is true that a new Tesla Model S P85D will set you back over 100K, you can get into a new EV such as the Nissan Leaf and soon to be avaliable Chevy Bolt and Tesla Model 3 for less than $35k. You must also remember to factor in that you will NEVER pay for gas/diesel and oil again and that in itself adds up to thousands of dollars/year…even when you account for the cost of the electricity used to fuel your EV! Then, when then you factor in all the money spent on tune-ups and engine/transmission/exhaust system repairs for most ICE powered vehicles – all the savings add up to reveal that most EV’s are much more economical to own and drive than your average ICE powered vehicle. MYTH: When the battery wears out a new battery will cost more than the car is worth. Note: all EV manufactures have excellent battery warranties/leasing options that serve to help new EV drivers “ease into” a better way to drive and are great incentives for adopting a this technology. Nissan for example, offers a battery warranty of 8 years/100,000 miles against defects and 5 years/60,000 miles against capacity loss – whichever comes first. MYTH: A used EV battery cannot be used for anything and is toxic waste. MYTH: There is nowhere to charge an EV? FACT: Most EV drivers charge their cars at home overnight with the dealer supplied standard equipment charging cord that allows the car to be plugged into any 110v outlet. Many drivers have faster Level 2 charging units installed in their homes so they can charge up even faster. Plugged in and charging at a friend’s barn. When out on the road there are over 25 thousand EV charging stations in the USA alone and the number is growing every day. To find out how many are near you just take a look at www.plugshare.com. MYTH: Charging an EV is SLOW! FACT: While not as fast as filling up the fuel tank EV charging is getting faster every day. Currently there are three levels of charging for most EV’s. Level 1. AKA Trickle Charge. This is the method of charging that most EV owners use to fuel their vehicles while they sleep. The car comes with a charging cable with J1772 SAE plug that will fill the battery at the rate of 5-7 miles of range added per hour. Level 2. This method of charging, that also uses the J1772 SAE plug, can be found at most of the publicly avaliable charging stations in cities and towns. 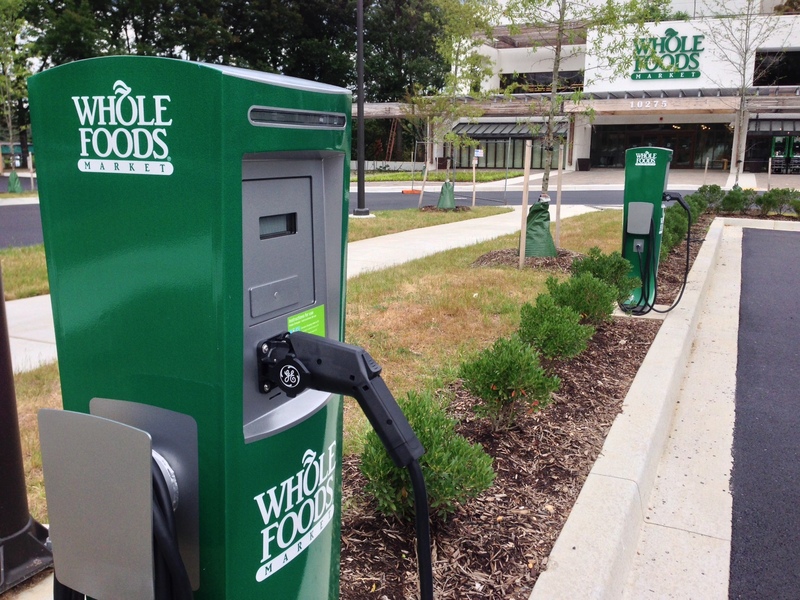 These units are often found near shopping centers, movie theatres, resturants and downtown areas and will fill up an EV in 1-4 hours depending on how low the vehicle’s battery was upon plugging in. These units can be installed in your garage at home and there are some portable models as well. Level 3. The fastest method of charging a fast charge capable EV. Using dedicated fast charging equipment and CHAdeMO or CCS equipped EV can be charged to 80% capacity in as little as 20 minutes! FACT: Most EV owners love their cars so much that they have become “crusaders” of the technology and promote them every chance they get because they know from experience that that they are a much better way to drive. FACT supported OPINION: Driving ICE powered vehicles is like purchasing a subscription to dependency on a highly toxic, highly addictive drug that shortens your life while constantly draining your bank account and damaging everything it comes in contact with. Be the change you wish to see in the world and the world will change….or do nothing and nothing will ever change…it is your choice. Special Thanks to the members of the Blue Ridge Electric Vehicle Club for supporting the future of transportation and renewable energy technologies. * Parts replaced under warranty included one shock absorber, 1 strut, grease for the power window actuators, and two suspension bushings – all of these things are not EV specific and are commonly replaced/repaired items on all road vehicles. Non-warranty covered and non-user replaceable parts that needed replacement due to age/wear = Tires and brake fluid. Total cost = $610. After “Godzilla” the 4Runner dies, I will never go back to gas. It had to happen eventually…routine maintenance. I have been driving my Leaf now for over 30k miles and the little EV has required no specialized routine maintenance by me other than the occasional washing and vacuuming, a set of new windshield wiper blades, adding a little air to the tires, and the occasional topping off of the washer fluid – you know, the things you would need to do to any type of vehicular construct no matter its fuel source. 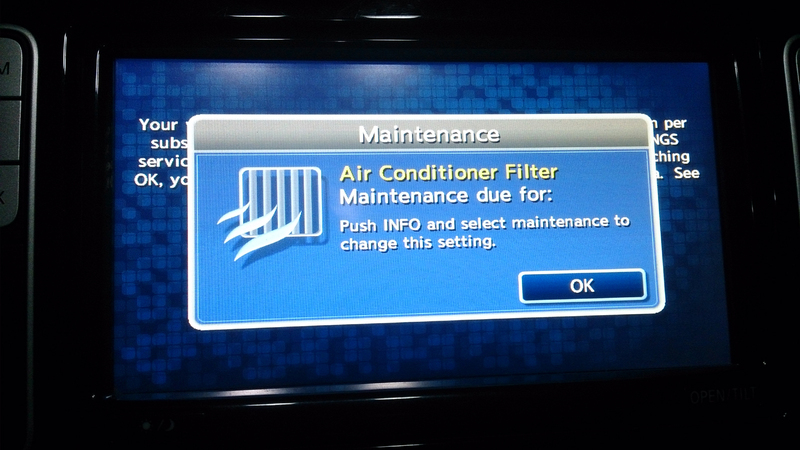 Recently however the Leaf popped up a message on the infotainment/nav screen and informed me that it needed maintenance on its Air Conditioner Filter aka: cabin air filter. Below I have outlined the step by step method I used to change the filter. 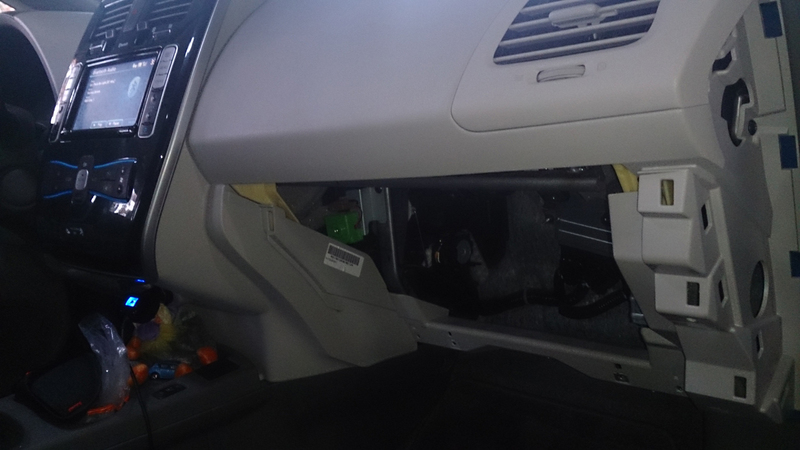 Remove the glove box in its entirety–a simple matter of removing a few screws and then gently pulling the unit down and toward the rear. 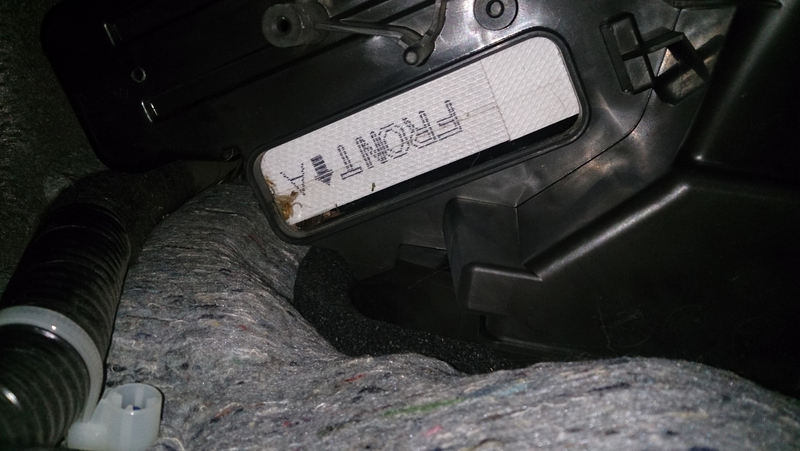 (This does not need to be done if you are a contortionist and want to use the tiny plastic door located on the back left of the inside of the glove box). This is a view with the glove box removed. 2. A look inside reveals the ECM – the “brains” of the beast – bolted to the bulkhead. 3. Looking to the left of the ECM we see the air handler system. 4. Note the white plastic cover (black in some model Leaf’s). 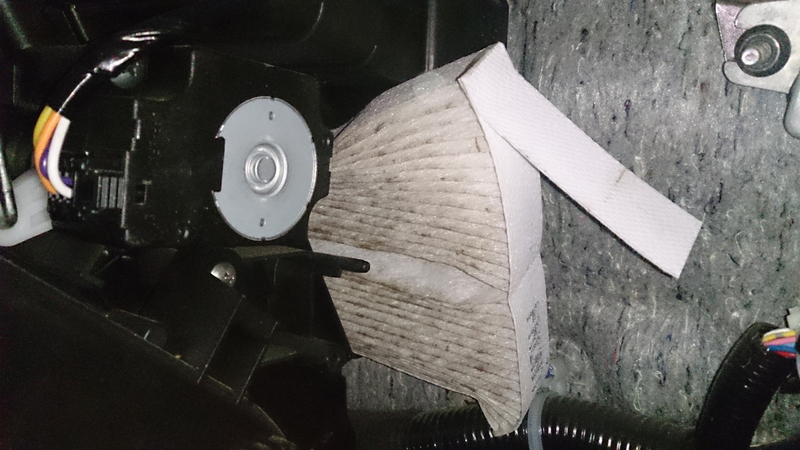 You will need to remove this to access the air filter. 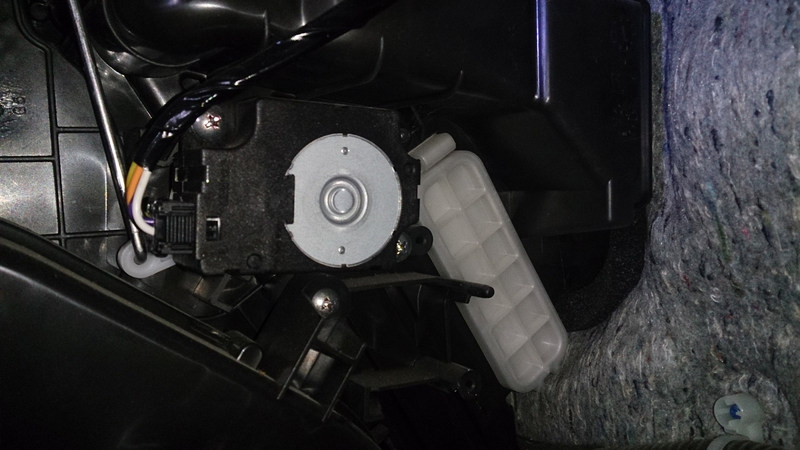 No tools are needed, just simply locate the tab on the bottom of the cover and lift outward to remove the cover to reveal the air filter. Mine was overdue to be changed so there was an assortment of botanical debris collected around and on the forward side of the filter. 5. Lift the flexible tab near the top of the filter (just above the word front in the above and below photos) and pull gently down and out to dislodge the top of the filter from its housing. 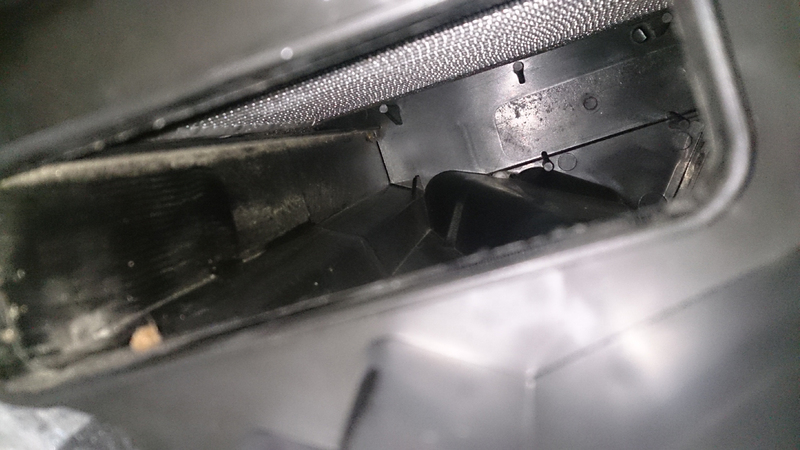 Then pop out the bottom and the filter will slide out as in the next photo if you do it properly. 6. Continue to slide the filter outward until it stops. You will then need to gently work the other side of the filter loose to get it out of the housing. Once out, you can inspect it for damage and debris. 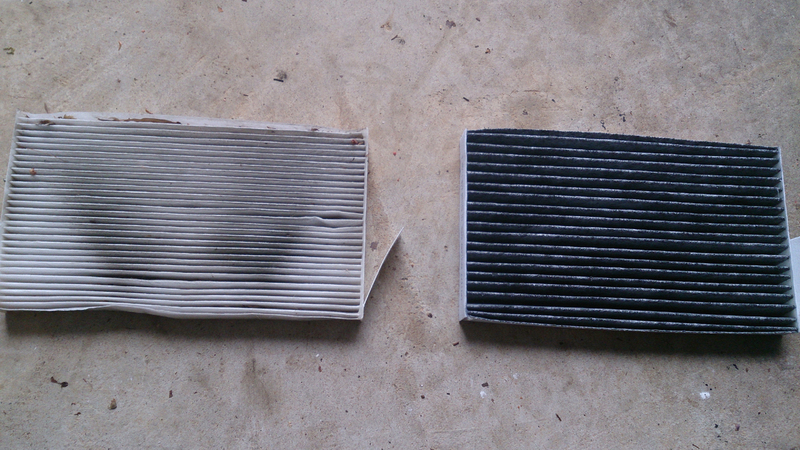 The old and new filters compared side by side. The old one (30k miles) is on the left. The new one looks darker due to a coating of charcoal and baking soda that will act as an air freshener apparently. 7. Installing the new filter is the reverse of removal but you will need to be careful in how you insert the filter to get it just right. I found this video tutorial very helpful – especially for this part of the job. 8. The type of filter I used is pictured below. After the filter is inserted, replace all the parts and you are good to go for another 15k miles or so. By replacing the filter myself I saved around $50 labor cost (as quoted by my local Nissan dealership)! Costs: $35 for the filter and about an hour of my time. This is not that bad considering this is the first in-depth preventative maintenance (that was not covered in the warranty*) that I have completed on the car…in 30k miles! Had this been a gasoline/diesel powered vehicle I would have had to spend far more time and money over the same 30K mile time-frame. For example to keep my 1999 Toyota 4Runner “Godzilla” running in an efficient as possible manner (for a machine with so many miles – 200+k – and so many moving parts that can and will wear out due to constant use thereby lowering the fuel economy of the vehicle and lowering the amount of money in my bank account) I use G-Oil, a bio-based fully synthetic motor oil, and I change the filter when I change the oil. Just the oil/filter changes for my 1999 Toyota 4Runner have cost me $230** over the last 30k miles! Operational costs for user replaceable parts and non warranty covered parts for the Leaf during this same period of time = $55 (wiper blades and cabin air filter)! The simple fact that EV’s do not have as many many moving parts as ICE (petroleum) powered vehicles makes them much more reliable and cost effective to operate than their fossil fuel powered counterparts. This is one of the many reasons that EV’s are superior to everything else on the road. After “Godzilla” dies, I will never go back to gas. In July of 2015 I documented a full weekend of travels in my 2012 Nissan Leaf. I did this to show anyone and everyone interested in the Nissan Leaf, or in driving electric, just how I use this remarkable plug-in electric vehicle on a daily basis. What you will see in the video is a typical summer weekend for me driving my Nissan Leaf EV. All video footage was recorded by myself and friend Pierce Curren as we traveled between Brevard and Asheville North Carolina over July 4th weekend 2015. Lengthy travel segments have been compressed using time-lapse techniques. Please visit Pierce’s Scaly Adventures and learn more about Pierce and his families mission to educate the world about the truth of wildlife, animals and the people that are working to conserve, protect and understand them via his true reality TV show Pierce’s Scaly Adventures. Music by The Steep Canyon Rangers and Narayanaya used with permission. Video by Steve O’Neil and Pierce Curren of Pierce’s Scaly Adventures. Editing by Steve O’Neil of Earthshine Nature Programs. 1. More people are buying EV’s or PHEV’s or EV REx ( for the remainder of this article collectively called EV’s) than ever before. In many areas there is just not enough charging station infrastructure to cover all the EV’s that need to charge, especially on busy days. 2. Some uninformed or inconsiderate EV drivers are treating EV charging spaces as a right not a privilege. They park in the space, plug in their car and walk off, sometimes leaving it there or many hours even after it is fully charged. It is as if they believe that they are entitled to park in that space simply because they have an EV or that they perceive the spot to be a standard parking space to be used as long as they like. 3. The space has been ICE’d by an inconsiderate or unobservant gasoline powered auto driver. 4. Plug In Hybrid Electric vehicles (PHEV) and Range Extended Electric Vehicles (EVREx) drivers that have a gasoline back up, are plugging in at charging stations when they just want to top off their battery to save gas and ignoring battery electric vehicles that may need to charge. How can we stop this madness? If you drive an EV please follow these 12 simple rules of charging station etiquette (see sources at end of article) and all of us–from the pioneering early adopters, forward thinkers and tree hugging earth worshipers to the EV tech geeks and and those just out to save some money on gas–will be able to work together in helping to promote the future of EV’s and their associated charging infrastructure. If your EV is fully electric and runs on battery power 100% of the time, common sense and good etiquette says you should have priority over EV’s with internal combustion powered range extending technologies such as the Chevrolet Volt or BMW i3 REx. If you are the driver of a Plug In Hybrid or Range Extended EV, and any of the below conditions apply, please do not hog the charging station. -There is a small number of charging stations. -You see battery-electric EV’s waiting nearby to charge. -Your vehicle has enough of a charge/fuel to get you to your destination. – Your car has a gasoline engine to fall back on if you run out of charge. Please do the right thing, be courteous, and let the battery electric EV’s charge first. Remember that some of them may have come a great distance and need a charge just to get home. …unless they are fully charged. See #2 below. 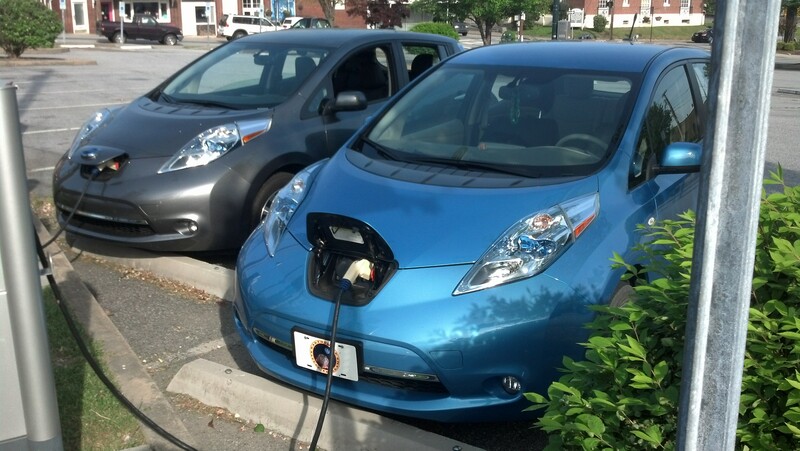 If you arrive at a charging station and another EV is charging, please do not unplug it. You have no idea how far they have to go and how much power they will need to get there. However, if their car has finished charging as indicated by the blinking charge indicator lights on the car’s dash, or as indicated on the charging station’s screen, then you may unplug it, close their charge port, and plug in your car. In this event, the driver of the EV in need of a charge should leave a note explaining why it was unplugged. The note should be full of gratitude and should always include your cell number and/or a business card. Be aware that on some later model EV’s the charging cord cannot be removed without being unlocked by the driver. In this case it is entirely up to the driver of the plugged in vehicle to be aware of his car’s status and unplug and move it when its charging cycle is complete or when he has enough charge to get to his next destination. Please occupy a charging station only while your EV is actively charging. As soon as the charging session is completed, no matter if your battery is full or when you have enough range to reach your destination, please unplug your car and move it to allow access for another driver in need. Please remember that these are charging spots, not standard parking spots. Using a charging space as a standard parking space is really not cool. Would you leave your gas car parked at the pump for several hours after its tank was full and if you did so, what would happen? 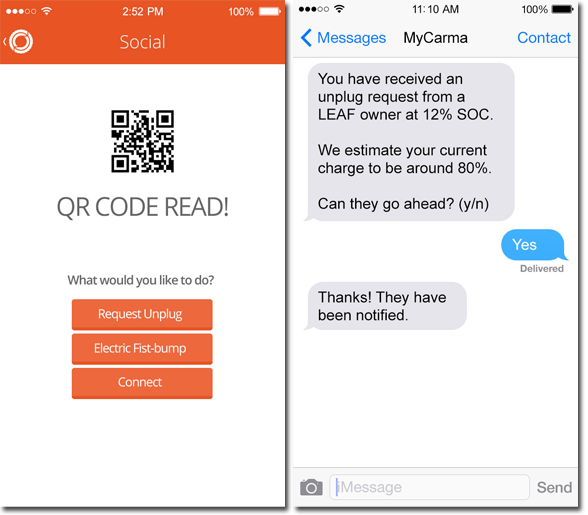 Most EV’s, or EV networks such as Chargepoint, will text you when the vehicle is full. If your vehicle/network texts you to say “I’m full!” then please, free up the charger for another driver. 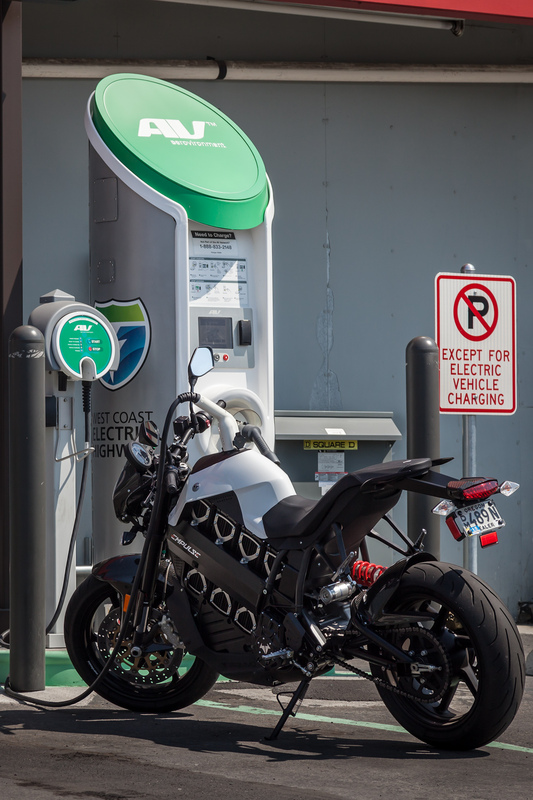 In some areas with pay to charge access, the charging network will continue to charge you a fee for as long as your vehicle is plugged in and in and even after it is fully charged. This is a great motivator for the vehicle owner to get unplugged and moved as soon as it is charged in order to avoid overage fees. 4. Charge Only When Really Necessary and Share and Share Alike. Just because you drive an EV does not mean you’re entitled to an EV charging spot–remember it is not a parking spot for those with the most expensive EV’s, or perceived higher social status, it is meant to be equally shared by all Plug In Electric Vehicle drivers. If you do not need the extra juice, please leave the spot open so another driver can use it. 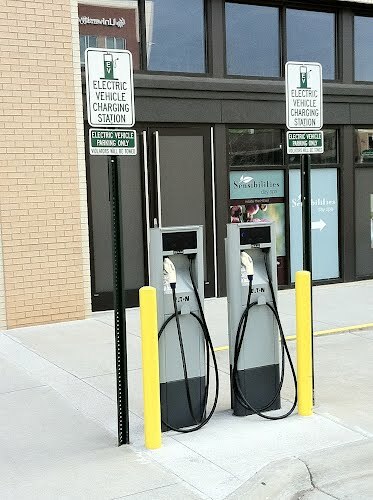 Personal Observation: I have noted on several occasions, at one particular charging station in the south Asheville, NC area, that certain repeat offenders treat the only two available free charging stations in front of a certain Hilton Hotel as regular parking spots. These owners will often leave their vehicles, of various manufacturers, in these spots for many hours at a time thereby blocking assess to other EV owners in need. I noted this once again on January 03, 2015 when I arrived to view a movie at 2:30 pm. Two Chevy Volts occupied both charging stations and were actively charging. There was no way to park beside them and wait to charge as the only other available parking spot was handicapped access only. 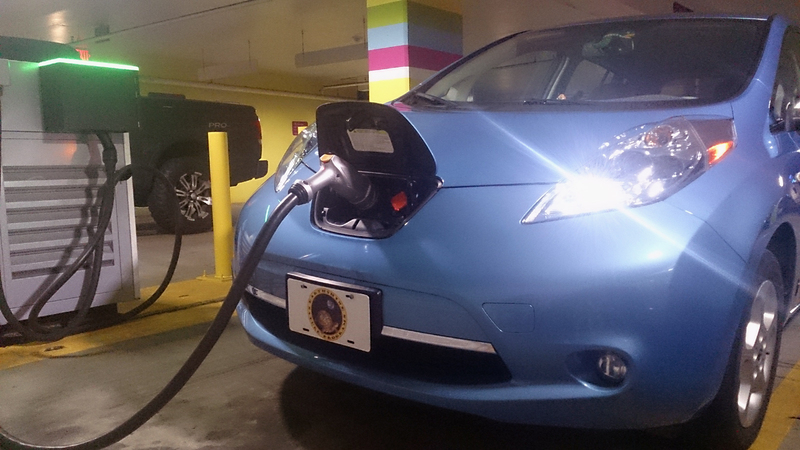 My Leaf was low on juice and needed a charge to get home after the movie. Since I had 45 min until the movie started, I parked nearby and decided to have a beer at a nearby restaurant in order to keep an eye on the cars in the hopes that one of them would leave and I could therefore get a charge during the movie. When it was almost time for the movie to start I checked both cars’ charging status and noted that one was fully charged and the other was still charging. I could not wait any longer so went on to the movie. After the movie I found that the Volt that was still charging before the movie, almost three hours earlier, was gone and had been replaced by a Leaf that was actively charging. The other car, the same volt that I noted to be fully charged before the movie, remained, still plugged in and still fully charged just like I found it over 3.5 hours previous. According to this information from Chevy it takes around 4 hours to fully charge a Volt, and since the Volt in question was fully charged before I entered the movie theater and remained plugged in over three hours later, it seems that that the volt owner was using this spot as a privileged parking spot rather than an EV charging station. This is just totally uncool and very bad charging station etiquette and, as I have said before, please do not hog charging stations and always share with other EV owners in need. 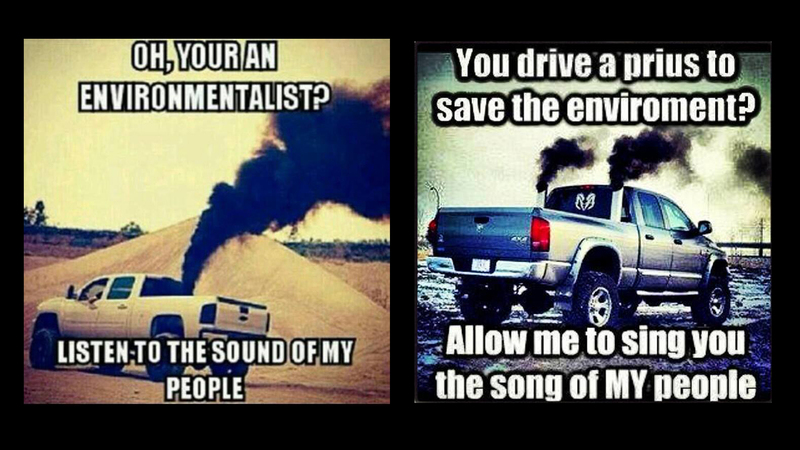 Anything less makes you and other EV drivers look bad. I know it goes without saying but please, never park like I did in this well composed photo that illustrates really bad parking etiquette no matter what you are driving. This goes without saying but simply because you drive an EV does not mean you can park in a handicap space or on a curb just to be closer to a charging station. Do not do it unless you enjoy having your car towed. If the charging spot you counted on using has been occupied by another EV for an extended period of time or has been ICEd—in other words, a gasoline powered Internal Combustion Engine powered vehicle is taking up the spot—the EV driver should leave a polite note on the vehicle explaining the predicament. The note should be viewed as a good-will gesture that will hopefully work to convince the offender not to make the mistake again. Please also note that in some areas such as Raleigh, NC, drivers of internal combustion engine powered vehicles that park in spaces reserved for EV charging are subject to high fines. It doesn’t matter what you drive, how much money you make, where you live, or who you are, or if someone else was in the charging spot before you, then that is your tough luck and you are going to have to play be the rules and the etiquette, be nice, and wait your turn. If you are really in need of a charge and the spot you need is occupied, and you are able to park next to the car that is currently charging, you can signal the other driver that you would like them to plug you in when they are finished charging by opening your charging port/door. It is also a good idea to carry in your car “charge” cards like these from Pluginamerica.com. You can put them on your dash when you are in need of a charge as a signal to the other driver to plug you in when they leave. Another really cool high tech option is to use a myEV datalogger * not only to keep track of your vehicle’s stats and health, but it also allows you to ask other EV drivers if you can unplug their vehicle via a text message, wherever they may be. See an example image from the app below. 9: Register With A Charging Network. If you are a frequent charging station user then it will benefit you to register with the charging networks that serve your area. It will also greatly assist you to download the charging station locator apps (such as Chargepoint and Plugshare) to your smartphone. With these you will be able to pull up all nearby stations and, depending on the app, see which stations are occupied and you will also be able to comment on if the station was functional or not or any other issues other station users need to be aware of. 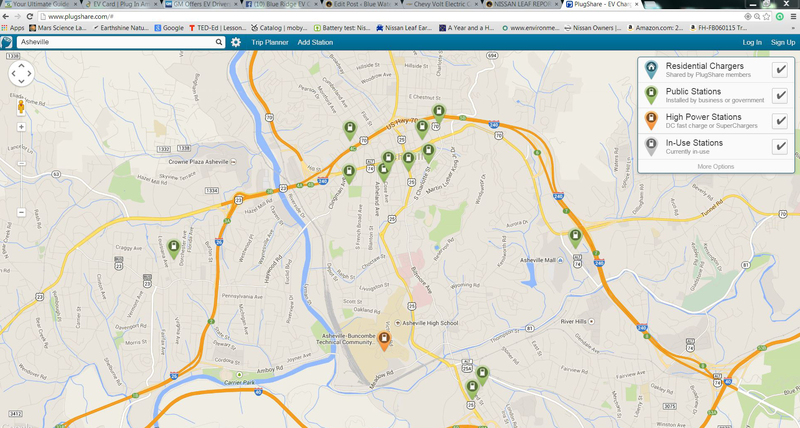 The map below is from the Plugshare.com website/App showing charging stations in Asheville, NC USA. If you are a local business owner/operator and have installed an EV charging station that is not on any of the charging station networks and/or you live in an area that does not have a strong charging station infrastructure, then you should really consider registering your charging station with one of the charging networks and put your station on the map. This will not only let other EV drivers know you are out there via their cars navigation system and/or app, but it will also give more people access to your business and more money in your pocket if you decide to charge a fee for the use of your station. Watch that cord! While your car is plugged in, make sure the charging cord is either flat on the ground and/or tucked under your car so pedestrians do not accidentally trip or drive over it. You would not want to have the surprise of a nasty lawsuit thrown in your face because someone tripped over your charging cord and was injured. Once your car has finished charging, remember to wind the charging cord back up onto its holder if the station is so equipped, to keep it neat and out of the way of others. As stated previously in Rule #4, just because you drive an EV does not mean you’re entitled to an EV charging spot. Remember, it is not a parking spot for those with the most expensive EV’s or perceived high social status, it is meant to be equally shared by all EV drivers and it is a privilege, not a right. Remember this: You are the future of clean transportation, you are helping an entire new industry get off the ground and at the same time lowering the nation’s consumption of fossil fuels by driving electric. However, owning and driving an EV is a personal choice and as a direct consequence of that choice, any charging stations out there are there for your convenience, especially the ones that are offered free of charge. Many of these charging stations are offered by nearby businesses so please be courteous to those who have provided it, take care to look after the chargers and report any issues to the owners. Lastly, if you are in need of a charge from somewhere in between charging stations or at an even more remote location without EV charging station infrastructure, such as a barn, gas station wall outlet (as I wrote about on day one when we drove our new Leaf across half of Tennessee), or a beer and ice shack at a festival (as seen in this article ), do not assume that access to the power is free. Be courteous, positively represent all EV owners everywhere, offer to pay for any power used, or at least give the business/outlet owner a tip. 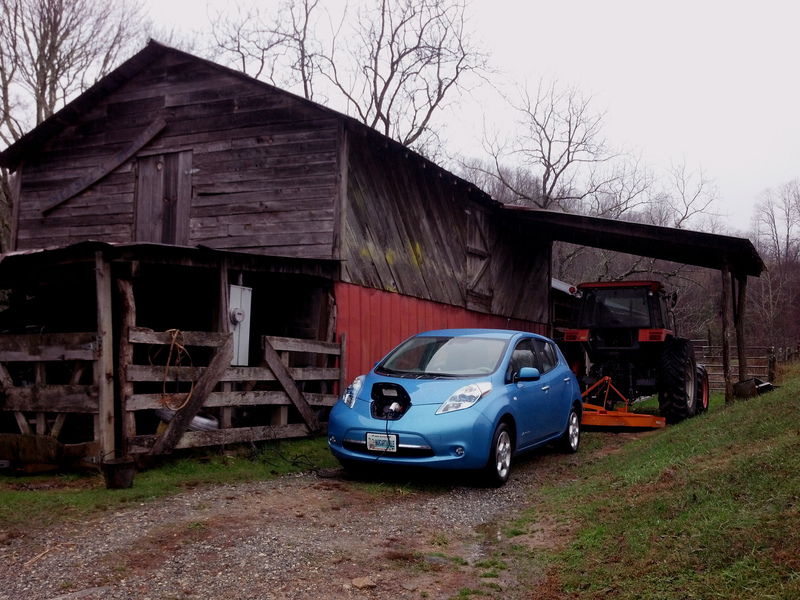 Charging my Leaf at the Earthshine Discovery Center barn in Lake Toxaway, NC. The good folks at Earthshine will let you charge if you are in dire need of some juice–please be sure to tip them for the charge. While charging take a walk around the farm and see what this wonderful place has to offer–you will be glad you did. Hopefully soon I will have this location on Plugshare as a residential emergency charge point. If you do not see it there please contact me for more information on how to access it when you are in need of a charge. We do not want to in any way be known as rogues, bums, or moochers and give a bad name to the EV community as a whole. I gladly donated $5 to a children’s charity for one hour’s access to this gas stations’ outdoor wall outlet. 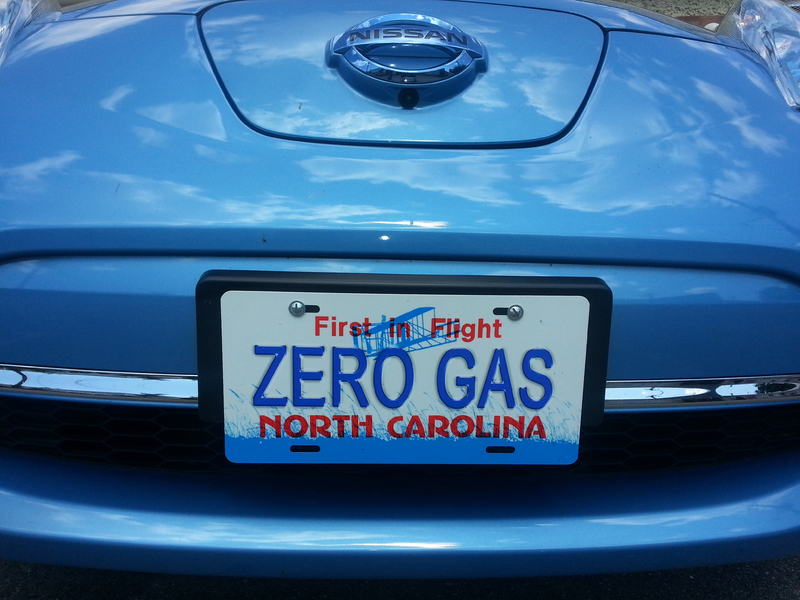 Being an EV owner and driver means you are also an ambassador for a gas-free future. Help make that future an even brighter reality by spending time talking with people who stop to ask questions when you are plugged in at public charging stations or parking your EV in a public parking lot. Be nice and genuine to those who ask questions, do not be in a hurry and always spread the word about the joys of driving electric electric in any way you are able. I know that is a lot of information to process but I believe you will see that these “rules” of EV charging etiquette are really just basic common sense that when applied, will make your EV ownership experience better for you and for those you share the roads of the future with. “In a battery-powered electric vehicle, regenerative braking (also called regen) is the conversion of the vehicle’s kinetic energy into chemical energy stored in the battery, where it can be used later to drive the vehicle. It is braking because it also serves to slow the vehicle. It is regenerative because the energy is recaptured in the battery where it can be used again.” Source Greg Solberg, Firmware Engineer Tesla Motors. Read more of Greg’s great article on regen here. Regenerative Breaking mechanisms have been used for over a century, have a very fascinating history, have many very interesting applications including early experimentation with the Amitron and Voltswagon concept cars by AMC. Regenerative systems developed by are now used on the worlds best selling electric vehicle, the Nissan Leaf and all other EV’s and hybrids on the roads today. I have owned my 2012 Nissan Leaf now for 13 months and have been keeping detailed daily notes on SOC, distance driven, temperature and other data points of interest. Recently I started taking notes on the regeneration that my car produces during my daily commute. Specifically a the 3.4 mile section of my commute that is almost all downhill (see a graphic representation of the route below). 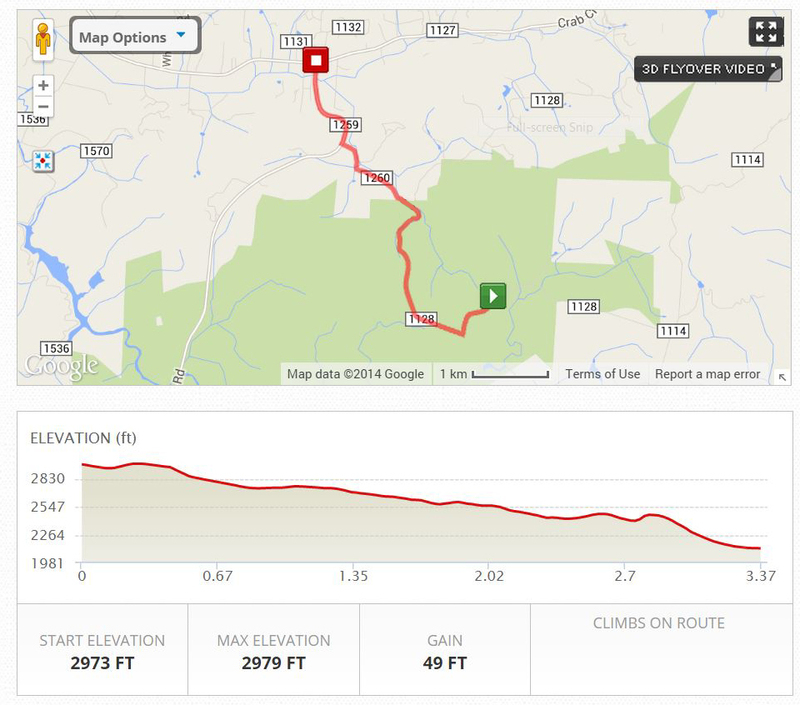 Recently I began to wonder just how far per day this 3.4 mile descent with 845 feet of elevation loss would take me on braking and gravity produced free fuel. In the hopes of answering that question with some degree of accuracy I developed an experiment with the procedure listed below. Every day I used in the experiment I drove as I do on a normal day; in ECO mode and with all possible environmental variables such as road conditions, traffic conditions, different routes*, elevation loss or gain, temperature, humidity, wind resistance, tire resistance, speed, accessories used, and others variables in order to keep it as real world as possible. *I do not drive the same route every day due to errands I often to run after work. UPDATE 1/25/15; Speaking of environmental variables effecting regeneration, on one recent occasion I had to drive the 3.4 miles section of route immediately after a motor-grader had scraped the road. The road surface was the consistency of something like thick beach sand mixed with damp oatmeal. The car bogged down a bit but powered through it but the regenerative breaking system was practically useless since I had to keep gently accelerating in order to keep moving forward. At the bottom of the 3.4 mile route I had regenerated only 1 mile of range. I am sure this will lower my overall average just a bit once I recalculate the numbers at some point this spring but science can be a harsh mistress. = 90/7 = 12.85 average miles of potential range regenerated per day. I first recorded the SOC from the GOM at the top of the route, drove the 3.4 mile route, stopped at the bottom and recorded the number of regenerated miles, reset the trip odometer to 0 and drove until I had reached the first recorded SOC from the top of the route. = 72.1/7 = 10.3* average miles of potential range regenerated per day! *I continue to keep a daily record of regeneration on this route, so this number will change as I average in those numbers. In the spring of 2015, I will post an update to this story with the updated findings. Based on the data for the short time period in question, the results seem to indicate that during this 3.4 mile descent my car generates an average of 10.5 miles of potential real world range per work day when driving this route. This data also suggests that the Leaf often powers itself home for free since the route is only 9.3 miles in length from the bottom of the descent to my home. I have documented this fact many times when upon reaching home the SOC is at or above the starting SOC when I left work. This ads up to a substantial amount of Leaf produced free fuel, but how much in a year is possible? 10.3 x 5=51.5 miles per week. 51.5 x 4 = 206 miles per month. 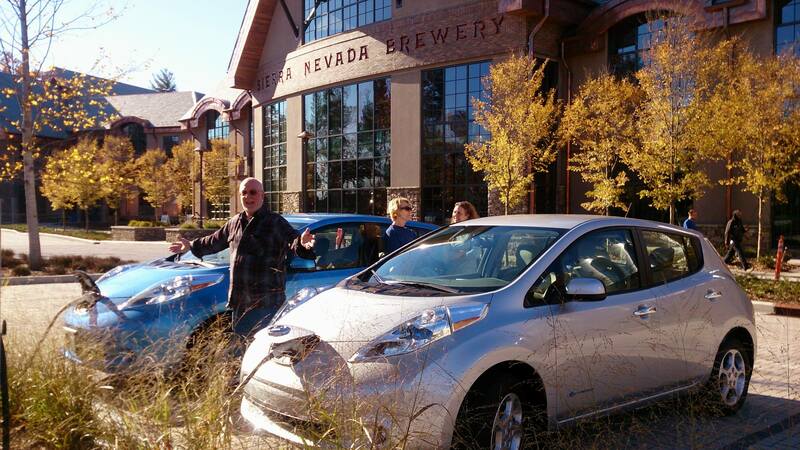 206 x 12 = 2472 miles of Leaf generated free electric fuel per year. I use a Kill A Watt meter to keep track of my Leaf’s power consumption. How much has this potentially saved me in power costs for the Leaf? $74.16 potentially saved each year just driving home from work every day! And this is only for this one route. I drive several other routes where I pull a good amount of regeneration from long descents so I wonder how much am I saving in power costs from those routes? Let’s just think about this fact – is there a consumer available, stock built, gasoline or diesel powered vehicle anywhere that will produce it’s own fuel. No. The facts are in: petroleum powered vehicles only take hard earned money from the owner, give nothing back but a ride, require lots of expensive fuel and maintenance, are often noisy, contribute to a polluted environment, enable the continued destruction of the Earth’s ecosystems through oil drilling/strip mining and pipeline construction in fragile environments, are not energy secure, and even fund terrorism. EV’s give so much back, have very low maintenance costs, are quiet and fun to drive, can be fueled on domestically generated energy and renewable energy generated at home or work and are therefore energy secure, do not fund terrorism, and produce a portion of their own fuel…for free! It is no wonder that some automakers, fossil fuel corporations and their supporters, and certain oil soaked politicians, are afraid of EV’s and will stop at nothing to ruin their image with negative ad campaigns and tactics. The simple reality is this; while the currently available electric vehicles do have some range limitations, they are far better in so many ways than petroleum powered vehicles. Given time, advancements in battery technology, expanded charging infrastructure, and the support from the people and our purchasing power, the EV will one day dominate the roads. Once a person drives an EV and experiences the joy of driving electric, freedom from the gas pump and from years of costly maintenance, more money in their pocket, the resulting cleaner air and environment that comes from driving EV, and with the ever growing option of powering their EV from home generated renewable energy such as solar, wind and micro-hydro–they will see that driving electric is the better choice and will hopefully trade in or recycle their old gas guzzler in favor of the future of transportation, the EV. 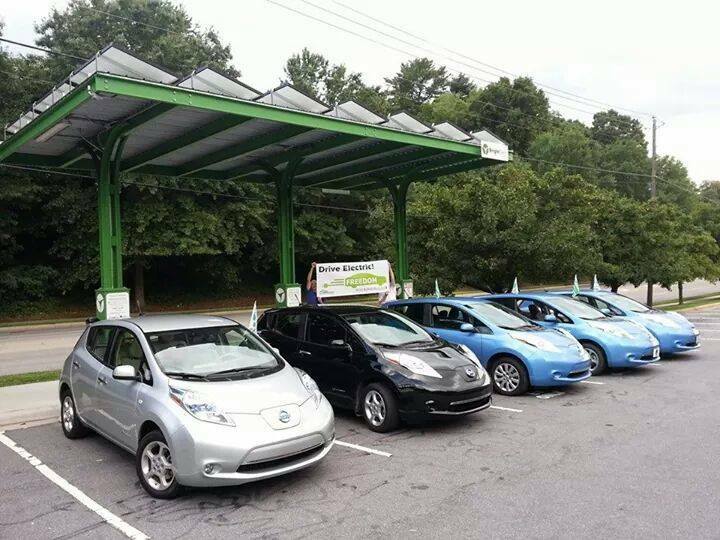 The Blue Ridge EV Club meeting at the BrightfieldTS solar charging canopy on Charlotte St. in Asheville, NC.